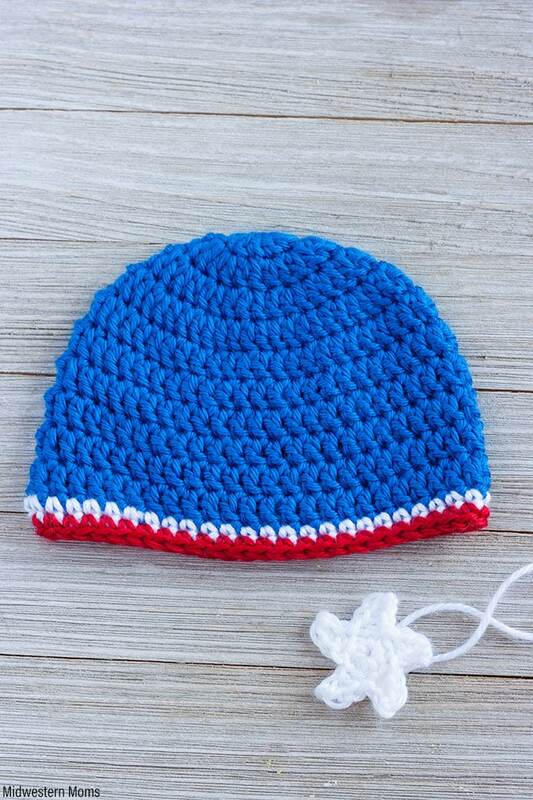 A simple patriotic crochet baby hat pattern for a little girl. 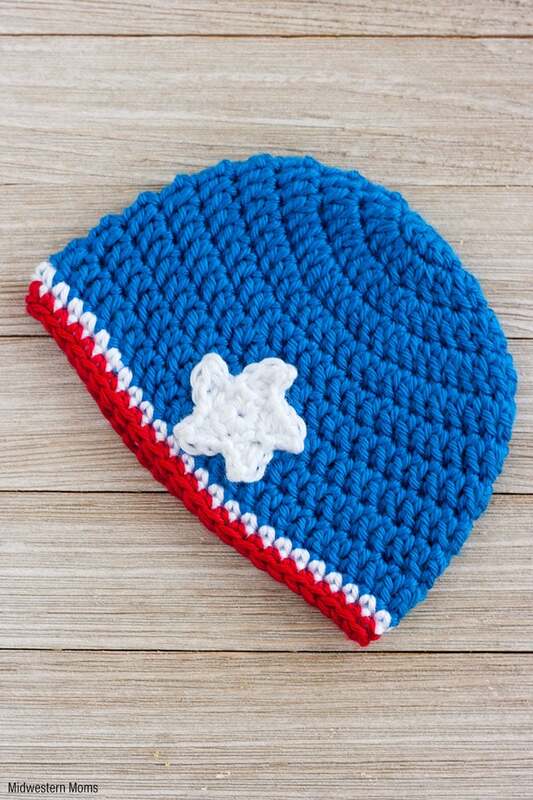 Using the red, white, and blue theme for inspiration and incorporating a cute little star makes this crochet baby hat perfect for showing off patriotism! I know it has been a while since I posted the patriotic baby hat for a boy, but I finally got to creating the girl version. I chose to make this one mainly blue to put the star on – sort of like the American flag. Then the small red and white stripes are like the stripes in the flag. The star is the same pattern that I used to create a patriotic crochet headband. You can also get these yarns online at Annie’s and Michaels! This pattern is for a newborn sized hat. It is easy to adjust the pattern for larger sizes with my printable measurement chart. After the pattern, there is a section to get a printable version and the email will include a link to the size chart. Round 1: (Blue Yarn) Starting with the Magic Circle, Double Crochet 12 stitches. Join at the top of the first stitch. Pull the magic circle closed. Round 3: Chain 2. *Double Crochet 1 stitch into the first stitch. Then 2 double crochets into the next. * Repeat from * to * for a total of 36 stitches. Join at the top of the first stitch. Round 4: Chain 2. * Double crochet 1 stitch into each of the first 2 stitches. Then double crochet 2 stitches into the next stitch. * Repeat from * to * for a total of 48 stitches. Join at the top of the first stitch. Cut your working yarn. Leave this tail long to use for sewing on to the hat. Pull your magic circle tight. Weave in the circle yarn end. Now, you just need to position the star where you want it on the hat and sew it on with the long tail. To get a printable version of this pattern and get a measurement chart for hats, simply put your email in the box below. 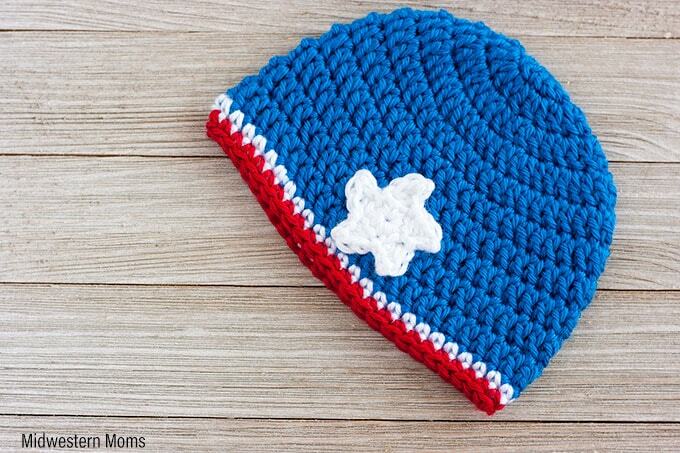 Patriotic crochet hat pattern is fantastic! Works up great! I want to make some adult hats, so hope your chart helps me with that!